The cathegory of "antisocial behaviour crime" is the highest ranking crime category when category crime rate is compared to the national average. "Antisocial behaviour crime" rate is at 133% of national crime rate which puts Gloucester on 19. position out of 104 England's and Wales' postcode areas in this crime category. 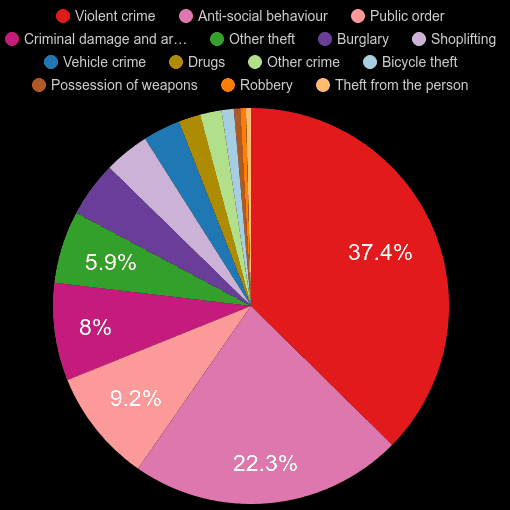 "Antisocial behaviour crime" makes up 35.9% of all crimes committed in the area. The total number of "antisocial behaviour crime" is 19.0k cases and has decreased by 13.5% when compared year-over-year in the period of March 2018 - February 2019. For further details, click on the name of a category.